Immunohistochemistry of paraffin-embedded human tonsillitis tissue slide using 60065-1-Ig( CXCR3B-specific antibody at dilution of 1:200 (under 10x lens). heat mediated antigen retrieved with Tris-EDTA buffer(pH9). Immunohistochemistry of paraffin-embedded human tonsillitis tissue slide using 60065-1-Ig( CXCR3B-specific antibody at dilution of 1:200 (under 40x lens). heat mediated antigen retrieved with Tris-EDTA buffer(pH9). CXCR3 (C-X-C chemokine receptor type 3) is a G protein-coupled, seven-transmembrane domain chemokine receptor that is expressed on the surface of a number of cell types, including activated CD4+ and CD8+ T cells, NK and NK-T cells, plasmacytoid dendritic cells, and some B cells (PMID: 16847335). CXCR3 binds and is activated by the three IFN-gamma-inducible chemokines: CXCL9, CXCL10, and CXCL11. Binding of these ligands to CXCR3 has been implicated in regulating T-cell infiltration during inflammation and tissue injury (PMID: 17250586). Alternatively spliced transcript variants encoding different isoforms have been found for this gene. One of the isoforms, CXCR3B, mediates the angiostatic activity of CXCR3 ligands and also acts as functional receptor for CXCL4 (PMID:12782716). 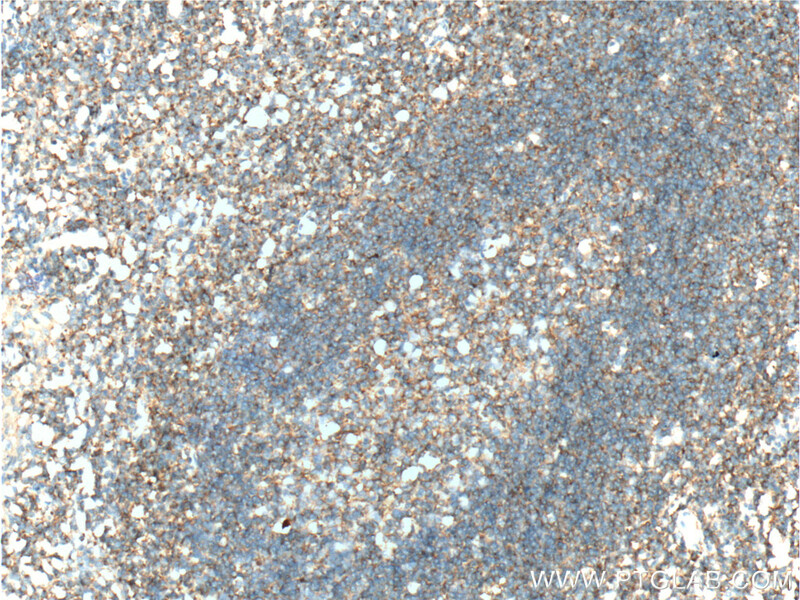 This monoclonal antibody is specific to CXCR3B. Pericyte regulation of vascular remodeling through the CXC receptor 3. A novel CXCR3-B chemokine receptor-induced growth-inhibitory signal in cancer cells is mediated through the regulation of Bach-1 protein and Nrf2 protein nuclear translocation. Differential Regulation of Pericyte Function by the CXC Receptor 3. Overexpression of the chemokine receptor CXCR3 and its correlation with favorable prognosis in gastric cancer. Upregulation of angiostatic chemokines IP-10/CXCL10 and I-TAC/CXCL11 in human obesity and their implication for adipose tissue angiogenesis. Altered CXCR3 isoform expression regulates prostate cancer cell migration and invasion. Immunohistochemistry of paraffin-embedded human brain tissue slide using 60065-1-Ig( CXCR3B-specific antibody at dilution of 1:200 (under 10x lens). 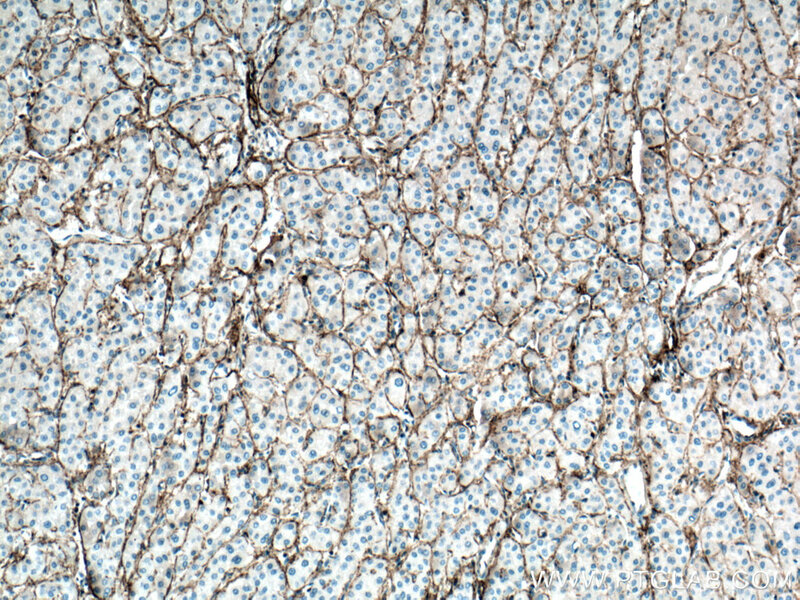 Immunohistochemistry of paraffin-embedded human brain tissue slide using 60065-1-Ig( CXCR3B-specific antibody at dilution of 1:200 (under 40x lens). Immunohistochemistry of paraffin-embedded human liver cancer tissue slide using 60065-1-Ig (CXCR3B-specific antibody) at dilution of 1:200 (under 10x lens) heat mediated antigen retrieved with Tris-EDTA buffer(pH9). Immunohistochemistry of paraffin-embedded human liver cancer tissue slide using 60065-1-Ig (CXCR3B-specific antibody) at dilution of 1:200 (under 40x lens) heat mediated antigen retrieved with Tris-EDTA buffer(pH9).